An enjoyable piece that spoke volumes about their relationship. Well done. Always glad to see your comments Sandra, especially when you enjoy my writing – thanks! Memories always a great way to go. Thanks – pretty unbelievable that your story came from a true memory! One I don’t think I’ll ever forget. I was 10 minutes from home but it took almost 2 hours to find a way back onto the beach. This was long before common folks had cell phones. I had a beeper though and my family was beeping me like crazy. You’ve really captured the sadness of separation and the anxiety which accompanies reconnection. Good story. Glad it worked for you – thanks for stopping by! nice story. i sense the heart ache and anxiety and isolation. I’m rooting for it all to work out over clams – and maybe a few brewski’s. Very nice take on the prompt. I sense a father trying to reconnect with his sons…there is hope lingering somewhere here. A really lovely piece. You asked for constructive criticism, but I don’t have any to give – every word was the right one. My favourite story so far this week. After 40 years, I have a feeling time has healed whatever went down before and the sons may be looking forward to this reunion as much as dad. You’re right – it would be interesting to write the same story from the perspective of one of the sons. Thanks for reading! First…this was excellent! So much going on in so few words. 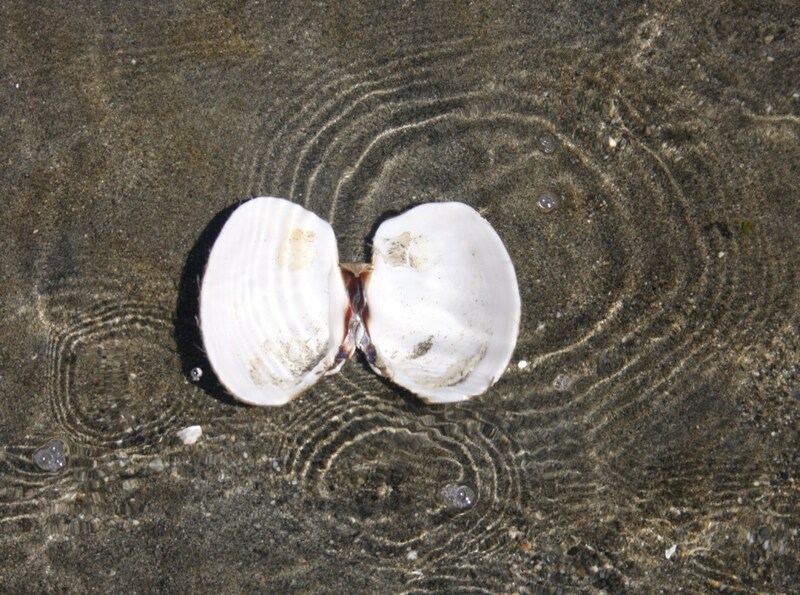 Second…I have been clam digging enough to know what a pain those wily mollusks can be. Finally…I feel so sad for your main character. I have so many questions for him. I hope all goes well with his boys. Thanks Raina – I’m not even sure how it’ll work out myself, but I’d call it a kind of sad hopefulness. As usual, yours was great this week! Great story. Maybe he should have shown his feelings a bit more, then he wouldn’t have been estranged? But then there wouldn’t be any stories if everyone just got along with each other, would there? Thanks for visiting my story too. I have a feeling there’s a lot of complication in their past, but maybe it’s all water under the bridge by now. Thanks for the kind words! I can feel the pain of the father’s separation. Poignant piece, Brian. Very well written. Oops sorry about that . I meant to post a link to my Friday fictioneers story. Delete that bit if you can. Cat jumped on the keyboard. Sounds like you’ve gone clam digging in the past. Hope that’s the only part based in reality. Loved it. Very believable voice. I have been clam digging, but yep, that’s the only connection to my life thankfully. Thanks and I’m glad you liked it! Well done, I could feel the father’s anxiety and I hope it was a good reunion. Well done, sir. Especially the niggling with the clams at the beginning. That’s a really sweet story..
Well we usually get great father and son stories from Doug, but as he’s gone smutty this week you’ve done a fantastic job of picking up the baton. Maybe we’ll fire him and have you for the role in future! Seriously though, great story – you tell us so much about the man and his relationship with his son in this little piece. I loved the first line about the clams getting stronger – perfect way of ntroducing his age to the careful reader. Sorry it took me so long to get here! It was a wild weekend! I love your word choice to set the mood and tone of the piece. “black and sharp.” I could feel my own hand digging into the sand to “pinch” the clam. Great writing! What a perfect way to show his memories and anxieties about the relationship! I hope the clambake is the bridge that will bring them to the start of recreating their sense of family. I enjoyed the sentiment in your story, and wondered about what happened (or didn’t happen) in those 40 years, that brought your character’s apprehension. Good job! I like the way that the clams have grown stronger over the last forty years. It made me think back forty years and how just about everything was much lighter and easier to carry in those days. “…his offering clutched tightly to his chest.” I really enjoyed this piece, Brian. Age illustrated with subtle yet telling strokes. The foreboding shore, the bleak feel to it all. A Winslow Homer painting from his dark period. Bold strokes this week my friend.